Gorjuss Phone Sleeves The most Gorjuss way to store one of your most treasured items; this lovely handy sleeve is suitable for many different phones and devices. Gorjuss Phone Sleeves Perfect for iPhone 4/4S/5/5C/5S, iPod touch. Also suitable for many other devices. 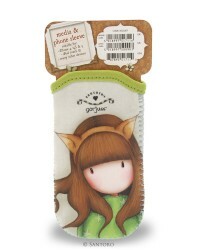 Gorjuss Phone Sleeve Approx. size: 7 cm wide and 13 cm high.